A constellation is a group of stars that form a long-recognized pattern in the sky, as viewed from Earth. The stars that make up a constellation do not represent any meaningful order in the universe. Those stars may be at very different distances from Earth and from one another. Constellations seen from Earth would be shaped much differently and would be unrecognizable if viewed from another part of our galaxy. The naming of constellations dates back to ancient civilizations. Although some constellations may resemble the animals, objects, or people for which they were named, others were merely named in honor of those figures. Many of the constellations were originally given Greek names and are related to ancient mythology. These names were later replaced by their Latin equivalents, names by which they are still known today. Asterism: Familiar star pattern that is not a constellation. Celestial sphere: The sky or imaginary sphere that surrounds Earth and provides a visual surface on which astronomers plot celestial objects and chart their apparent movement due to Earth's rotation. Ecliptic: The apparent path of the Sun, the Moon, and the major planets among the stars in one year, as viewed from Earth. and structure of the universe and their place in it. Their naming of the different stars reflects their views or mythology. For example, the constellations the Romans called Ursa Major and Cassiopeia (pronounced kas-eeo-PEE-a) were called Whirling Man and Whirling Woman by the Navajo. Some familiar star groups known by common names are not constellations at all. These groups are called asterisms. Two examples are the Big Dipper and the Little Dipper. The Big Dipper, also known as the Plough, is part of the constellation Ursa Major (the Great Bear). The Little Dipper is part of the constellation Ursa Minor. Eighty-eight constellations encompass the present-day celestial sphere (the sky or imaginary sphere that surrounds Earth). Each of these constellations is associated with a definite region in the celestial sphere. The yearly path of the Sun, the Moon, and the major planets among the stars, as viewed from Earth, is called the ecliptic. Twelve constellations are located on or near the ecliptic. These constellations—Aries, Taurus, Gemini, Cancer, Leo, Virgo, Libra, Scorpio, Sagittarius, Capricornus, Aquarius, and Pisces—are known as the constellations of the zodiac. The remaining constellations can be viewed in the celestial sphere during the year from either the Northern Hemisphere (28 constellations) or the Southern Hemisphere (48 constellations). The daily rotation of Earth on it axis causes the constellations to appear to move westward across the sky each night. The yearly revolution of Earth around the Sun, which brings about the seasons, causes different constellations to come into view during the seasons. 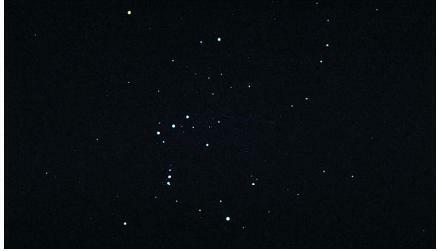 Can orions belt be seen from the United states, in Wisconsin? Because the constellationis exactly identical to the Orion. I thought it could only be seen from the eastern hemisphere?